The United States is laboring through the weakest economic recovery since the Great Depression. Median household income is stagnant and labor-force participation is dismal. Compared to the strong growth of the pro-market Reagan years and pro-market Clinton years, it is awful. Here’s a chart from a presentation. 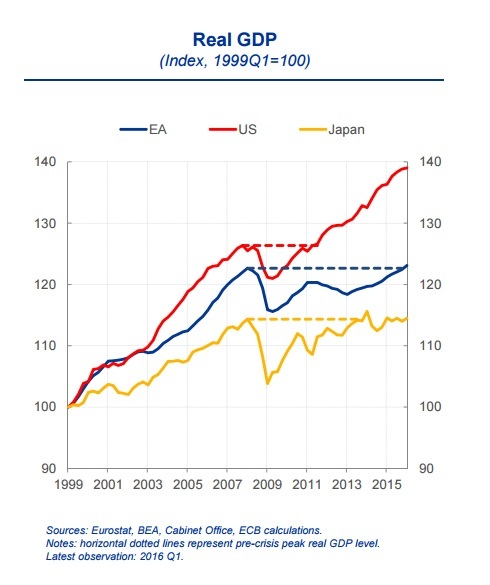 by economists from the European Central Bank, and it shows how much the United States has grown since 1999 compared to Japan and euro nations. We’ve enjoyed nearly twice as much growth as Europe and almost three times as much growth as Japan. Which is remarkable since those countries aren’t as rich as the United States and they should grow faster according to convergence theory. So while it’s true that Obamanomics hasn’t been good for the United States, it’s apparently not as bad as Abenomics in Japan and Hollandenomics (and Renzinomics and Tsiprasnomics) in Europe. Allan Meltzer explains why Europe is lagging in an article for the Hoover Institution. Europe has become the model for how democratic capitalism can give way to the welfare state. Following a surge of market-driven growth after World War II, there was a rise across the continent in income redistribution and regulations intended to protect workers and consumers, and to achieve “fairness.” From the 1960s onward, high tax rates and heavy regulations slowed economic growth. And many welfare state programs became roadblocks to economic progress by resisting reforms and prolonging the current European recession. …France and Italy are not as far along to disaster as Greece, but their welfare systems are also difficult to reduce to regain competitiveness. …Monetary policy cannot overcome real, structural problems. Spain and Ireland showed that EU members can restore growth most effectively by making…painful real changes… Sluggish growth will continue until EU officials adopt policies that encourage private investment. It’s depressing to think that some American politicians want to copy European failure. Some of the candidates in the 2016 presidential race offer more welfare state benefits as a remedy for current voter malaise. The promise is that the way to make everyone better off is by taxing high incomes and distributing more to others. That’s the route that many in Europe took. Instead of the promised happy outcome, much of Europe got slow growth and high unemployment and an ever greater need to restore competitiveness by reducing the expanded welfare state. …Prime Minister Thatcher often said, “The welfare state will end when they run out of YOUR money.” If she was right, the end for Europe is here. And the lesson for the United States is to adopt less costly policies before debt markets force the change. …the lesson for the United States is that we will not escape the problems of the welfare state. Even the left-wing bureaucrats at the OECD sort of admit Europe is falling behind. I’ve previously shared data from the OECD showing much higher living standards in the US than in Europe, and here are some excerpts from a recent report on global migration patterns for high-skilled workers. …migrants to the EU are younger and less well educated than those in other OECD destinations. Of the total pool of highly-educated third-country migrants residing in EU and OECD countries, the EU hosts less than one-third (31%), while more than half (57%) are in North America. …most importantly, many labour migrants are not coming to the EU under programmes for skilled workers. …EU Member States covered by EU legal migration policies received annually less than 80 thousand highly qualified third country labour migrants. By comparison, Canada and Australia have annual admissions under their selective economic migration programmes for highly-qualified workers of 60 thousand each. In the section on recommendations, you won’t be surprised to learn that the OECD failed to suggest pro-market reforms. There’s boilerplate language about streamlining the process for high-skill immigrants, but nothing about the stifling tax burdens and expensive welfare states that cause European economies to be so stagnant and unappealing. One very visible manifestation of inferior living standards in Europe is that people generally have very cramped housing conditions compared to the United States (even Americans in poverty have more living space than the average European). And to make matters worse, air conditioning is the exception not the rule. Amusingly, Europeans pretend to feel superior about their summertime misery, as reported by the Washington Post. Whereas many Americans would probably never consider living or working in buildings without air conditioning, many Germans think that life without climate control is far superior. …many Europeans visiting the U.S. frequently complain about the “freezing cold” temperatures inside buses or hotels. …Europe thinks America’s love of air-conditioning is actually quite daft. …according to the Environmental Protection Agency, …demand for air-conditioning has only increased over the past decades. …the United States consumes more energy for air conditioning than any other country. …Europeans are generally more used to warmer room temperatures because most of them grew up without any air-conditioning. As one might expect, the issue is being used by climate alarmists. Another factor that may explain Europe’s sniffy reaction toward American cooling is the continent’s climate change awareness. According to a 2014 survey, a majority of Europeans would welcome more action to stop global warming. Two thirds of all E.U. citizens said that economies should be transformed in an environmentally-friendly manner. Cooling uses much more energy than heating, which is why many Europeans prefer sweating for a few days… America’s air-conditioning addiction may also have another negative side effect: It will make it harder for the U.S. to ask other countries to continue to abstain from using it to save energy. …”If everyone were to adopt the U.S.’s air-conditioning lifestyle, energy use could rise tenfold by 2050,” Cox added, referring to the 87-percent ratio of households with air-conditioning in the United States. I’m much more tolerant of heat than the average American, so I probably could survive in a world without air conditioning. But I hope that day never arrives and I continue to enjoy the full benefits of living in a first-world nation. 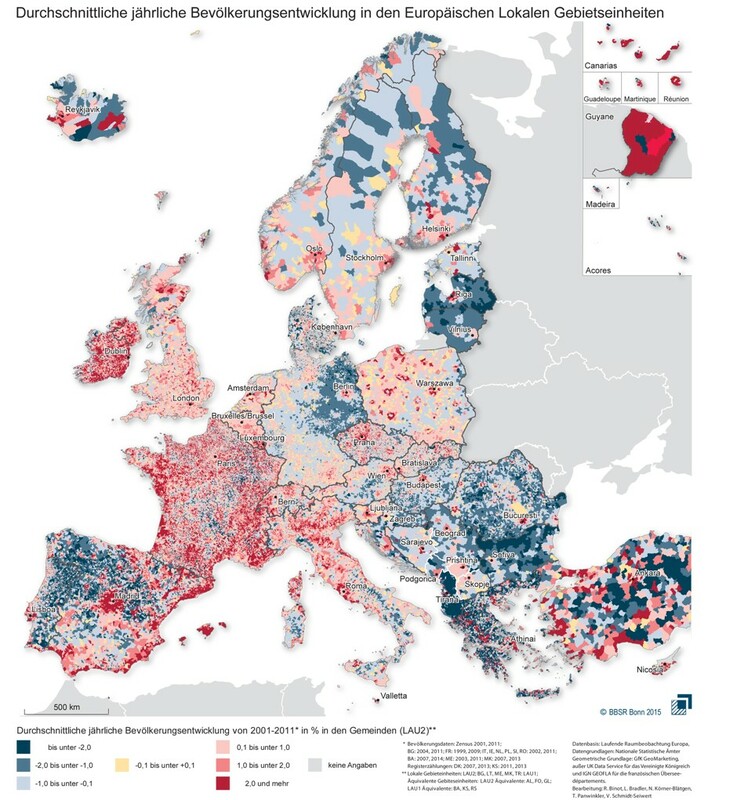 Let’s close with a fascinating map showing populations changes in Europe from 2001-2011. It’s in German, but all you need to know is that dark red means a 2-percent-plus increase in population while dark blue means a decline of at least 2 percent. France and Ireland have population growth, as well as (to a lesser extent) Northern Italy and Poland. But take a look at Portugal, Northwestern Spain, Eastern Germany, and the non-Polish portions of Eastern Europe. You’ll understand why I fret about demographic crisis in both Western Europe and Eastern Europe. Thank you, nedlandp, for pointing out why most households in Europe don’t have air conditioning. In a nutshell, most of Europe is further to the north than the US is, so it gets hot for a few days, creating the impression that AC is mostly unnecessary, though to be honest, whether that is true or not depends on your own heat tolerance. Even so, bringing up “summertime misery” is a stretch, considering some houses are designed with cooling mechanisms such as high ceilings and window shutters. But who knows, maybe AC usage might increase as the units themselves become more efficient? There’s also the cost of electricity and the construction of houses. I haven’t been to Europe before, so I can’t really say much. My main beef with that Washington Post article is the inability to address those three factors (climate, cost and construction) that contribute to the lower use of AC in Europe, not to mention its use of the notion of the ‘superior European’ which makes my skin crawl since many Europeans don’t give a toss about American habits and vice-versa, not to mention Europe is composed of multiple countries of varying attitudes, whereas America is one big country. Worse, the article had ~1,300 insulting comments full of ad-hominem Europe-bashing, many of which espouse (and were mostly triggered by) said notion. Some even used outdated, hurtful clichés about hygiene habits which just make no sense in this day and age. It drives me insane to see a display of public ignorance and blatant disregard for facts and statistics. What doesn’t help is all the thumbs-ups those comments get. It makes me disappointed with my compatriots; they should know better. Many of those comments keep rubbing in a deadly heatwave in 2003 where 70,000 elderly people died from heat exhaustion (14,000 in France alone). Let’s get this straight: no-one was prepared for such an unusual heat wave (the last one before that was in the 1540s). A similar heat wave struck Chicago in 1995, where 739 elderly people died since those households didn’t have AC either, and that says more about those commentators than the Europeans they’re demonising. Given that the population of France in 2003 was 22.2 times that of Chicago in 1995, I believe it’s just another plain old example of the pot calling the kettle black. Sadly, the internet is just making us dumber and dumber despite all its merits. As a side note, the 2003 heat-wave episode exposes one of the negative effects of statism and overreliance on the government, as many workers went on vacation and left the elders behind. While the heatwave was unusual , the lax attitude was just unacceptable. Overall, I think air conditioning use has nothing to do with economics and politics. If you see any issues with this analysis, give me a shout and I’ll think about what I wrote. P.S. Correct me if I’m wrong, but I recall reading that after 2003, retirement homes in France were required by law to have AC units installed and PSA warnings were introduced to encourage drinking more fluids and avoiding regular sources of heat during future heat waves, which I think substantially reduced the death count. P.P.S. To be fair, though, European houses are brick or stone, whereas American houses are mostly made of wood. American houses are generally bigger since the whole country happens to be bigger (as said) and less dense, not to mention wood is cheaper. While I appreciate your preference for big houses, I wouldn’t use housing space to imply higher standards, considering the damaging effects of suburban sprawl such as increased car dependence (we all know what that can lead to) and the increased burden of, well, managing a bigger house. This is when quality trumps quantity, but I digress. Overall, not many people even care about house size just as long as it suits their needs. Regarding the AC issue, even Mediterranean cities like Rome and Madrid are at the same latitude as New York City. For Europeans to complain about our use of AC is like Canadians complaining over-use of AC in Texas. We know that taxes and regulation bring on slow growth, but why? The normal answer is that taxes on the wealthy reduce investment and regulations stifle creativity and entrepreneurship. But, that is only part of the answer. The cost of taxes and regulation are always paid by consumers in the prices they pay, since taxes and regulation are a cost of doing business. The dynamics of a change in tax rates or regulation are a little more complicated. If a senior executive is hit with a tax increase, gross pay does not automatically increase to maintain net pay at the same level, however you can be sure the executive will demand a compensation adjustment, possibly in untaxed perks. Any cost increase will flow through to prices. The cost of regulation is also complicated in that an existing company will add the cost to product prices, however a potential competitor who would have lowered prices may be eliminated. As prices go up quantities purchased go down, causing unemployment and slowing growth. Support for the unemployed and demands for more buying power again forces taxes up and the cycle begins again. Consumers pay the bulk of all taxes. It matters little whether the taxes are collected based on salaries, profits, or sales. Finally, for all his faults as a horrible candidate, seems to me, Trump’s mistakes seem more reversible than Hillary’s. Tariffs and border restrictions can be rolled back — even Europe, the declining continent, has done so, by reducing tariffs and opening up to more immigration. But try to roll back a welfare program. Which country in Europe has done that? That had been my assessment of McCain vs Obama too. Wars and military adventures can end. After all Iraqis and Afghans don’t vote in America. But try to privatize social security. Those mistakes are permanent. With every passing election we long ever more for candidate choices past. When the American electorate starts voting like the French (inevitable as coercive collectivism tightens its stranglehold on low growth and desperation) Obama will look like an old libertarian. European laws beget a European electorate and European voting patterns. That’s another inevitability Americans are delusional about. You can’t adopt European laws and retain American dynamism. The two percent growth trendline is not convincing yet. It will never convince anyone. Once you get into the desperation of decline you just hang on to the next election, the next redistribution, to survive another day. Growth becomes a distant worry. The decline cycle cements. Not seeing Europe for what it is. That is the pivotal delusion of the American voter. Is there future? – Any future! … in becoming a one percent growth trendline nation? If voters are really oblivious to what it means to make their country a one percent growth trendline continent — then there is really no hope for anything. Everything will dismantle, French style first, Greek style soon after, then Soviet style. With a growth rate that is a full three percentage points below the world average, nothing is sustainable — nothing! Everything will dismantle as your prosperity status in the world arithmetically and deterministically declines. One percent growth trendline means that the rest of the world is simply catching up to you at a yearly rate of three percent! — compounding! Simple arithmetic shows the swift deterministic decline. How long will it take for France to become a middle income country, the future equivalent of today’s Mexico? With France’s per capita GDP at $44,538, the world average at $10,798 (2014 data), and growth trendlines of 0.8% and 4% respectively, it will take exactly 44 years for France to become a middle-income country; the year 2059 equivalent of Mexico. That is when, at current trendlines, average GDP per capita will be $63,500 for both France and the world average. Of course, still better than today in absolute terms. But do you want your children to live in 2059 France? That would be like someone being happy their children live in Angola today arguing that their standard of living is higher than 1850’s New York (it is!). Europe and the West became prosperous and pulled ahead of the rest of the world roughly between 1700 and 1950. It did so by sustaining a growth trendline that was above the world average for many years. Of course, it took a long time for the West to pull ahead because growth rates were not that fast back then. People lived in an overall much slower growing world back then so the modest growth divergence took a lot longer to compound. Most of the 1700-1950 period world growth rates were less than one percent annually. The West may have had a growth trendline advantage of half to one percent and it took two and a half centuries for that to compound. The west then reached its peak prosperity advantage in the 1970’s, when the rest of the world started its irreversible rapid growth trendline. Going forward, a growth differential of three percent will take a mere forty five years to compound and completely undo this western prosperity advantage. In two generations, Western standard of living will be re-absorbed into the world average. Half of the French who will suffer that ultimate fate are already alive today — and, as I said, it will not be a pretty ride. For America, today’s young children will live to reach that depressing world average prosperity parity milestone (if current trendline does not deteriorate further) – and again it won’t be a pretty ride either. Actually, many more Americans will live to see that fate because of technological advantages in longevity. Realize that reaching parity with world average prosperity is not some magical milestone, some discontinuity, something that will not be felt until reached. The malaise, desperation and somber mood of decline is felt at every stage. That is the fundamental force now at work in Europe. That is what is behind the cacophony of seemingly disparate and unfortunate events coming out of the continent. It is the disintegration of everything that is inevitably brought upon by compounding slower growth rates – to decline. Decline brings discord — and thank heavens it does! It is natural process. It is the natural self-corrective process of dismantling failed experiments; of bringing dead evolutionary branches to a closure, of breaking the pieces apart so that the successful parts may flourish in new independent beginnings. It is essentially the natural process of freeing energy trapped in failed cultural branches. The experiment that is falling apart in Europe is the hope that people will work for distant others, or that they may be ultimately coerced in doing so — by a democratic majority. For America and its current two percent growth trendline, its current $55,836 per capita GDP, the decline trajectory implies America is also on a quick and gloomy decline path to becoming a middle income nation. America is on trajectory to cross the average world parity point in 83 years, in 2098AD. But as I said, there is nothing magical about that arithmetic parity milestone – decline is felt every step of the way – in case you have not already noticed. But that is the more optimistic scenario for Americans. It implies that the effort-reward redistribution curve remains the same, so that growth can remain at 2% in the mid to long term, and that the rest of the world does not accelerate even further to catch up even sooner. The diagram of world growth trendline shows a history of acceleration: Virtually no growth between 0 and 1000AD, tiny growth between 1000AD and 1500AD, little growth thereafter, until the high growth of the modern era, and the breakneck world surge of the last forty years. Looking at that graph, the world growth graph through time, betting on a systemic slowdown of the trendline seems like the bet of a delusional fool. At two percent growth, decline is already here for America. And a systemic long term worsening politico-economic outlook will accelerate the trend even further. The average world growth trendline will diverge from modest American growth even further. BTW, those hoping to retain top prosperity through some sort of military means are delusional. Military might derives from economic prosperity and trying to maintain world power when your share of world GDP is declining only hastens the decline even further – a decline and a weakening that happens while making many enemies too – not a good situation. In America only ten percent of the population can probably make the above simple arithmetic decline trajectory calculations — and only three percent care for them when voting. In France, probably, more people can make that calculation but they probably care even less when voting. I don’t really know what the public skill and awareness numbers are, but they matter little, so long as they are a small percentage, far removed from majoritarian status. Rationality absent, the prosperity trajectory of voter-lemmings the world over will be serendipitously determined by relatively secondary issues. Like: Whether Hillary Clinton pressed this or that button on her laptop, whether amongst the 2.6 million people that will die in America next year there are a few more policemen, whether disgruntled domestic and international nutjobs kill another few dozen people, whether Trump brings back a few hundred thousand middle-income style jobs — so that we feel less pressure to step up to developed world skills — whether Trump thinks Carly Fiorina is actually ugly or not, whether he thinks Angelina Jolie is pretty, etc. In the end, whether Clinton engineers American prosperity decline on her laptop or on government computers makes little difference. Distracted by secondary issues, some electorates will get it right… serendipitously….most, — will not! That is why the Swiss remain a hope to those who believe that there may be a world of more firm voter rationality – however rare that might be. One successful branch is all that the evolutionary tree needs. The dead end of most branches is tragic, but evolution and human prosperity growth will continue, no matter what. Today’s mobility is a pivotal factor in limiting the damage at the personal level — the opportunity to jump on a successful branch. But don’t wait too long. The boat is listing but once it starts really sinking the exit chutes will jam. So, under the Clinton philosophy, and a majority of American voters, the five percent of people in America, those who most define how American prosperity competes against the rest of the world, will get a tax disincentive to produce. The other ninety five percent, who BTW are still in the world’s top five percent in terms of prosperity, will get to relax a bit more,… since “we are a rich nation that can afford the forced magnanimity of redistribution, so that the American middle class can remain in the world’s top five percent of prosperity”. Keep hoping lemmings! Both the high and lower end will get a disincentive to produce at levels necessary to keep America’s “most prosperous nation in the world” status. The effort-reward curve flattens — growth falls even further behind the rest of the world, decline starts compounding even faster — at European rates. The vicious cycle closes as desperate declining masses rush to the polling booth for even more redistribution. The end comes quickly. Then you will get candidates like Trump who claim that bringing back middle-income country skill jobs is the key to sustained prosperity in the world’s top three percent ?!?! This deluional hope is all part of the decline process desperation I mentioned above. It is all well underway now. Someone, somewhere, will find a silver lining of hope, an optimistic scenario. The event steamroller will relegate his brief hope to the dustbin. …….come moths………….…which light looks best? …………….the reeeeddddd one?……………… or the bluuuueeee one?………………. you are angry……………..and tired………………..…… very tired…………………………come to the comforts of coercive collectivism…………..…relax…………. we’ll take care of each other……………an easier path to prosperity is within reach………..no worries……no worries……once we, the people, take collective control of the economy……then we can fix things…..…let the power of politicians soothe you…….and sleep…..sleep….. The trajectory the country will take in the next eight years looks grim no matter who gets elected this November – and it’s all an indication that the voter-lemming has passed the point of no return (2008 was the pivotal last chance to escape year, as I pointed out many times). The voter-lemmings are now circling the drain. The time to avoid entering the social-capital loss vicious cycle was when things were going well. That time has passed. You can party on the Titanic, but if you have not made longer plans for a salvage boat you are a fool. P.S. The graph is missing the trajectory of the rest of the world, to complete the dismal picture. Twice as much growth (from a 1% to a 2% trendline) is still a dismal deterministic trajectory to decline when the rest of the world is growing twice as fast yet. P.P.S. In Europeans and air conditioning: I don’t necessarily disagree with European preferences; so long as they were a result of choice rather than the result of coercive environmental policy. The Greeks have a nice say about that: “όσα δεν φτάνει η αλεπού τα κάνει κρεμαστάρια” which translates to “That which the fox cannot reach it turns into hanging ornaments”. BTW, Greeks are smart people. Perhaps too smart for their own good? So smart that they long ago figured out how democracy works : You vote and take — easy. American provincial country bumpkins are finally awakening to the same European sophistication. The sophistication of the progressive intelligentsia. P.P.P.S. Boy, tax rates are already too high for me to work much. Can you tell?